Today for Force February we have more Luke as he transitions from The Empire Strikes Back to Return of the Jedi. And yes, we’re talking all drab now. Once Luke puts on the black, he pretty much never changes into anything else. 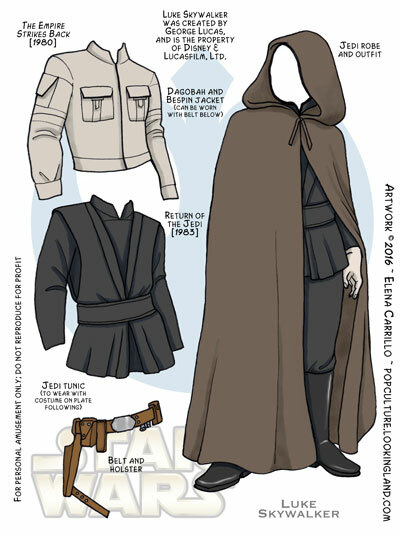 Fortunately, he has some layers to work with including this dark brown cloak he wears in his fist scene confronting Jabba the Hutt, and the black tunic he wears under it (and over the rest of his black suit, which is on the plate that will follow this one). 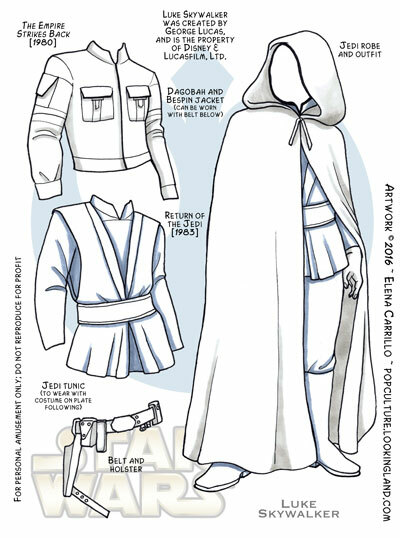 I also included on this plate, his grey Bespin jacket, which I mentioned yesterday, and his belt and holster, which also goes along with that set. I guess I could have connected the belt to the jacket. I know there was a reason I didn’t at the time, but it’s strangely lost to me now ~ ha! Just one more plate for Luke tomorrow to close out the other pieces of his Return of the Jedi ensemble. I went with a relatively light black for these outfits because I wanted to make sure the detailing was visible and, once again, deep saturated blacks don’t tend to print well (though printers have gotten progressively better over the years). Anyway, I really liked Luke in black. I never thought there was any actual danger of him being seduced to the Dark side, so it didn’t freak me out (as apparently it freaked out other people at the time). Since then, a lot has been made of the fact that the outfit gets disheveled before the end of the film and it’s revealed that the underside of the black fabric is white. That metaphor was also lost on me as a kid, but then I didn’t equate black with evil anyway. A plate for Leia tomorrow and then I’m doing some reorganizing, but I will definitely finish posting Luke and Leia over the first couple of week of March (maybe change to “Force Friday” until the all the extant plates are done. Then maybe I’ll go back to working on Dark Vader and/or The Force Awakens plates that I want to do. To see all Star Wars related posts and plates, click the tag or the category at right. Click the Luke Skywalker tag to see all of Luke’s plates. Luke Skywalker, Original Trilogy. Bookmark.